Federal agencies have deployed more than 10,000 employees, including nearly 3,000 civilians, to five states and three countries to assist local communities as they recover from the devastation wrought by Hurricane Matthew. The Federal Emergency Management Agency is spearheading the efforts, establishing survivor assistance, incident management, and search and rescue teams throughout the Carolinas, Georgia and Florida in response to disaster declarations issued by President Obama. FEMA has deployed 1,500 employees in an effort to distribute 6.9 million meals, 4.3 million liters of water, 89,000 blankets and 522 generators to affected regions. The National Guard initially deployed 8,000 guardsmen to prepare for the storm and help in the aftermath, though that number dipped to 6,000 on Wednesday. The citizen soldiers have rescued people and animals, cleared debris and helped combat flooding. 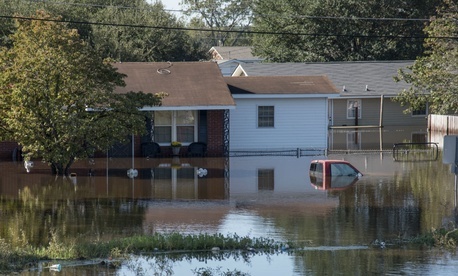 More guardsmen were activated as flooding in North Carolina worsened. The U.S. Northern Command has staffed seven Incident Support Bases in affected states and assisted in deploying resources. The Army Corps of Engineers has sent 100 employees to the hurricane zone to assist with power restoration, coastal damage assessments, emergency operation center activations and dam inspections. The U.S. Public Health Service, National Disaster Medical System and HHS’ Office of the Assistant Secretary for Preparedness and Response has deployed 570 personnel to assist in medical emergency efforts, with an additional 350 individuals on alert for possible activation. HHS sent a 46-member Disaster Medical Assistance Team to Brevard County, Florida, to assist a hospital in handling the surge in the demand for emergency services. The National Park Service deployed more than 130 personnel for Matthew response to “coordinate and oversee the assessment and recovery” of affected parks. Ten park units remain closed due to the storm as NPS continues to monitor the damage. Justice has deployed 77 law enforcement personnel to affected states, where a spokesman said they have conducted search and rescue missions along the coasts of North and South Carolina. They remain in the region awaiting additional missions, the spokesman said, and 50 more law enforcement officers and medics are on stand-by for deployment if necessary. USAID initially deployed Disaster Assistance Response Teams to Jamaica, Haiti and the Bahamas in anticipation of the storm, though the teams have since focused their efforts in just the latter two countries. More than 60 employees are currently deployed, according to a spokesman. USAID initially made $400,000 in aid available to the affected countries, and plans to make more available shortly. It has also sent hygiene kits, plastic sheeting, kitchen sets, blankets, collapsible water containers and water storage units to the region. “USAID is working with the government of Haiti and local non-governmental organizations to continually assess the damage and ensure life-saving emergency relief reaches people in need, especially in the hard-hit regions along the country's southwest peninsula,” said Gayle Smith, the agency’s administrator. She added the efforts were expected to benefit 100,000 people. The Federal Highway Administration deployed “about a dozen” employees for storm response, including through making damage assessments of roads and bridges. The Federal Motor Carrier Safety Association is issuing necessary emergency waivers and permits, while the Federal Aviation Administration has issued emergency flight restrictions. Energy has deployed nearly a dozen employees to FEMA’s National Response Coordination Center and other regional centers, a spokeswoman said. Energy officials have worked with industry to assist it in restoring power, including by holding daily calls both before and after the storm. In addition to FEMA’s efforts, U.S. Citizenship and Immigration Services has made relief available to those whose “application, petition or immigration status” has been affected by the storm. The Coast Guard has assisted in search and rescue missions and ensured safe commercial vessel navigation. It is also providing disaster relief in Haiti. SBA has made low-interest disaster loans available in North Carolina, and deployed staff to conduct “preliminary damage assessments” in affected regions. CNCS deployed more than 500 AmeriCorps members to assist with various FEMA, state, local and volunteer organizations’ efforts.